A new book on cold war espionage falsely accuses I.F. Stone of being a paid Soviet agent. D.D. Guttenplan wishes to thank Stewart Cass and Victor Navasky, who read a draft of this essay; Dr. Svetlana Chervonnaya, who pointed to documents not cited in Spies; and Alexander Guttenplan, who patiently translated materials from the Russian. The last time I saw Alexander Vassiliev he was slumped in a seat at the Royal Courts of Justice in London. A small, fair-haired man wearing a dark suit and a black shirt, Vassiliev was an ex-KGB officer who had helped Allen Weinstein, an American historian whose Perjury (1978) convinced most Americans that Alger Hiss had indeed been a Soviet spy, to write another book. The fruit of their collaboration, The Haunted Wood (1999), was hailed by the Los Angeles Times as “a small arsenal of smoking guns.” In The New York Review of Books, Thomas Powers declared that “anyone who wants to know what Hiss and his friends were up to can find a rich, convincing, and vivid report in The Haunted Wood.” Hiss, who’d died in 1996 still protesting his innocence, was already beyond redemption. For Weinstein, the acclaim merely accelerated his rise from the comparative obscurity of the Smith College history department, via the National Endowment for Democracy, to his appointment by President George W. Bush in April 2004 as archivist of the United States. The project seemed to have brought Vassiliev only grief. Not only did Weinstein, who couldn’t even read Russian, claim top billing; he used Vassiliev’s findings on Hiss in a 1997 reissue of Perjury without permission. Vassiliev was so angry that he wanted to sue, and turned for advice to The Nation‘s Victor Navasky, well known both as a defender of Alger Hiss and as a critic of Weinstein’s scholarship and ethics. Navasky replied that he was “reluctant to collaborate in any legal actions vis-à-vis Weinstein” but was curious about Vassiliev’s grievance. “In my universe,” Vassiliev replied in an e-mail, “the thing he did to me is called theft, and thieves get punished. I spent 2 years in the KGB archives, doing the research for The Haunted Wood. I gave up my career as a TV presenter and newspaper columnist for it. I smuggled from Russia hundreds of top secret non-declassified KGB documents, and therefore I can’t return there now.” But soon enough, still living in exile in London, beached by the tides of history, Vassiliev would find a new outlet for his anger. In the fall of 2000 John Lowenthal, a retired Rutgers law professor who had worked as a volunteer on the Hiss defense team, published a lengthy analysis of the latest evidence regarding Hiss in Intelligence and National Security, an obscure British quarterly. After Lowenthal posted on Amazon the portion of his review dealing with The Haunted Wood, Vassiliev decided to sue–not Lowenthal but the quarterly’s British publisher, Frank Cass, and Amazon. British courts are notoriously friendly to libel plaintiffs; for one thing, the burden of proof is on the defendant. (In the United States, Vassiliev would have had to prove that Lowenthal’s criticisms were untrue.) Vassiliev was so confident of an easy victory over Cass–followed by a lucrative settlement from Amazon–that he rejected repeated offers of four-figure sums (but no apology) from Cass’s lawyers. The trial began on June 9, 2003. When Lowenthal called me and asked if I’d be interested in reporting on the dispute, I resisted. I’d always thought there was something vaguely comical about our elders’ obsession with Alger Hiss. And after many years of working on a biography of I.F. Stone, I’d learned a great deal about the ambiguous history of American Communism. My stubbornly uninformed view was that Hiss was probably at the very least a secret Communist–I’d come across enough of those myself, including Nathaniel Weyl, who claimed to have been in the same group as Hiss in the 1930s. So why was I there in court, studying Vassiliev’s posture while sitting next to Victor Navasky, who’d flown to London to testify for the defense? Because there was something deeply compelling about John Lowenthal, who informed me during a series of telephone calls that he had stopped his chemotherapy for terminal throat cancer so he could concentrate on the case. I felt I owed it to John at least to witness his day in court. After four days of arguments, testimony and cross-examination, the jury first had to decide whether Lowenthal’s claim that Weinstein and Vassiliev “omit relevant facts” and “selectively replaced covernames with their own notion of the real names” was indeed defamatory. Likewise, Lowenthal’s suggestion that Vassiliev, “if he’s honest,” would–quoting Boris Labusov, a press officer of the SVR, the successor to the KGB–have to concede that “he never met the name of Alger Hiss in the context of some cooperation with some special services of the Soviet Union.” Since John freely admitted he’d intended to defame the authors of The Haunted Wood, that part was easy. The next hurdle was the defense of fair comment. Though he didn’t need to prove that everything Lowenthal had written was true (which would have meant proving Alger Hiss had been framed), Lowenthal’s publisher still had to show that “an honest person could express such views in the light of the material which Mr. Lowenthal knew at the time the article was published.” In other words, the jury, after being walked through the evidence, both from the recently released secret American code-breaking program known as VENONA and from the KGB archives that Vassiliev claimed to have transcribed, had to believe that a reasonable person could still consider the case against Hiss not closed. These were ordinary British men and women, not historians, and just in case the defense couldn’t convince them that “KGB documents had been misconstrued” to make it appear that Hiss was a spy, Cass’s lawyers also claimed that Lowenthal’s review was covered by “qualified privilege”–the greater latitude allowed when responding to an attack, in this case the attack on Hiss. Vassiliev, who acted as his own lawyer, was not an impressive witness. On the arcane but crucial question of whether, in his unfettered trawl through KGB archives, he’d ever seen a single document linking Alger Hiss with “Ales”–the code name of a Soviet agent in the 1940s who, Weinstein and Vassiliev insisted, had to be Hiss–he admitted he hadn’t. He also failed to provide a satisfactory account of just how he’d managed, despite being required to leave his files and notebook in a safe at the KGB press office at the end of each day, to smuggle out the notebooks with his extensive transcriptions of documents, which, he explained, he couldn’t even ask to have photocopied, because the contents were considered Russian state secrets. Even so, with the law stacked heavily in his favor, and with testimonials to the certainty of Hiss’s guilt from a veritable pantheon of historians (none of whom, however, including Allen Weinstein, deigned to testify in person), Vassiliev had every reason to expect victory. Which made the jury’s verdict, delivered on Friday, June 13, 2003, such a blow. Finding that Lowenthal had indeed implied a deliberate misreading of KGB documents regarding Hiss, the jury, based on what they’d seen and heard of the evidence, agreed that this was a conclusion an honest person might reach. The trial judge, Sir David Eady, who in recent years has been widely criticized in the British press for his alleged bias in favor of libel plaintiffs, also ruled against Vassiliev, holding that Lowenthal, in defending his friend Alger Hiss against the charge that he had betrayed his country, was also covered by qualified privilege. Vassiliev absorbed this unfolding catastrophe without showing any emotion. Only when the judge pronounced “an award of costs” did his shoulders seem to collapse under the weight of what he’d brought on himself. It is impossible not to savor the irony of an alliance between two paladins of cold war triumphalism and Vassiliev, a man who, raised amid the squalid hypocrisies of the Brezhnev era, not only writes that “It was my dream to be a Soviet spy” but then goes on, with evident satisfaction, to note: “The vetting process started, and I was ‘clean’: no Jews in either my background or my wife’s, no relatives abroad, already a member of the Soviet Communist Party.” And it would be reckless to ignore the question of Vassiliev’s circumstances in assessing the evidence he and his collaborators have assembled. Or to take on trust the Stakhanovite feat involved in transcribing or summarizing thousands of documents by hand in a period that, in Vassiliev’s account, began in early 1994, slowed down significantly by mid-1995 and ended in January 1996–while also supposedly managing to write draft chapters of The Haunted Wood and transfer his notes and drafts onto floppy disks. But it would also be dishonest to pretend that most of us, offered the chance at a similar lode, whatever the caveats, would be so fastidious as to simply walk away. If we look past Haynes and Klehr’s blistering ressentiment and assume, as I shall for the remainder of this essay, that Vassiliev’s notebooks are as represented, what do they tell us about the KGB, the Soviet Union and the astonishing cast of Americans–some of them Communists but many of them not–who interacted in various ways with the Soviet state, its clandestine organs and the American Communist Party? First, that very few of those described as “traitors” by Haynes and Klehr saw their actions as in any way inimical to the interests of the United States. (Vassiliev made this point repeatedly during the 2003 trial.) They may, of course, have simply been “in denial,” but it is striking how often, in the relatively small fraction of Vassiliev’s 1,115 pages of notes included in Spies, that even Americans like Julius Rosenberg, who engaged in the witting supply of classified information under the acknowledged direction of agents of a foreign power–a better definition of “spy” than any you will find in this book–were nonetheless careful to make clear their primary loyalty to the United States. Indeed, the later lives of a number of those “exposed” for the first time in Spies, having escaped the attention of McCarthy and his epigones, read like variations on the American Dream: Russell McNutt, an associate of Julius Rosenberg, became chief engineer of Gulf Oil; Bernard Redmont served as dean of Boston University’s journalism program; Henry Ware went on to advise the Boy Scouts and to found the Reston, Virginia, Useful Services Exchange, a widely emulated barter network; Gerald Graze headed CUNY’s research arm before joining the National Institutes of Health. Spies never explains why we should believe KGB officers, pushed to justify their existence (and expense accounts), when they claim information comes from an elaborately recruited “agent” rather than merely a source or contact. The Haunted Wood cites a July 1941 report from Konstantine Umansky, the Soviet ambassador, on a conversation with Treasury Secretary Henry Morgenthau, who asked “on my personal behalf to give me and Roosevelt the heads of German agents in the U.S.” because the FBI was doing such a lousy job–letting Moscow know that Morgenthau and perhaps FDR didn’t have confidence in J. Edgar Hoover. Haynes and Klehr don’t mention this incident, yet they condemn Morgenthau’s deputy Harry Dexter White for his own back-channel diplomacy. White was certainly a “source” of information. Indeed, there are official accounts of his contacts with the Soviets in American and Russian diplomatic archives. Spies quotes a 1944 memo from Vasily Zarubin, the KGB New York station chief, complaining that “‘Jurist’ [White] is rough around the edges and a lot of work has to be done on him before he will make a valuable informant. To date he has reported only what he deemed necessary….” White vociferously defended himself before the House UnAmerican Activities Committee in May 1948; three days later he was dead of a heart attack. Interestingly, Vassiliev’s first draft of this material, buried in Weinstein’s papers at Stanford, bore the title “Istochniki v Vashingtone“–in English, simply “Sources in Washington.” Though closer to the truth, that clearly wasn’t dramatic enough for Weinstein–or Haynes and Klehr. Spies does flesh out our knowledge of “Enormous”–the Soviet effort to penetrate American atomic research. Moscow’s persistent campaign to “turn” J. Robert Oppenheimer, and Oppenheimer’s even more determined rebuff to each approach, is laid out in fascinating detail (though the authors seem to have gone out of their way to ignore Kai Bird and Martin Sherwin’s account, based on American archives, of the same campaign from a different perspective in American Prometheus, their Pulitzer Prize-winning biography of Oppenheimer). Spies is invaluable in another way: it tells us what the SVR wants the West to know. This is apparent not only in what we are told: that the KGB successfully recruited scores of Americans; that it was the KGB and not Soviet physicists (or publicly available scientific information) that broke the US atomic monopoly; that the subsequent failures of Soviet intelligence after 1945 were due not to the self-immolation of Stalinism but the treachery of a few American turncoats. It is also apparent in what’s left out: the granular detail of who reported which information at what time to whom–and even more important, the use made (or not made) of that information by policy-makers in Moscow. Reading Vassiliev’s digest of Soviet documents gives us a pretty good idea of Moscow’s view of the world: treacherous, conspiratorial and subject to sudden seismic shifts (such as the Nazi-Soviet Pact or the campaign against Earl Browder, the only genuinely popular leader the CPUSA ever had). But this is also very much a view through the keyhole, and though every bit as titillating as such views often are, at best it offers a very partial (and much distorted) Soviet perspective on a much more complex American reality. The charge that I.F. Stone, the legendary investigative journalist and onetime Washington correspondent for this magazine, was a paid agent of the KGB has been a staple of far-right smear tactics since the early 1990s. Such attacks have in the past rested on two equally shaky legs: the on-again, off-again testimony of Oleg Kalugin, a retired KGB general who implicates Stone every time he has a book to sell (and then issues a “clarification” explaining that Stone was merely a contact, not a spy, after each episode); and the purported identification of Stone with “Blin,” the Russian word for “pancake” and the code name of an American journalist who figures in three of the messages between KGB agents in the United States and Moscow decoded under the VENONA project. Kalugin, a skillful self-publicist who once tried to peddle the idea that the Soviets detained American POWs in Vietnam long after the end of the war, doesn’t deserve to be taken seriously. But the VENONA messages are real, albeit problematic: the National Security Agency long resisted releasing the Russian texts, and the English versions in the public domain include a great deal of tendentious annotation, much of it apparently the work of Robert Lamphere, the FBI’s liaison to the project. They are also ambiguous–not least about the apparently simple matter of Blin’s identity. Not all of Lamphere’s colleagues were convinced. The FBI’s Washington field office noted that Blin was described as “earning as much as 1500 dollars a month,” while “the income of Stone…was considerably less than that.” (In 1944, Stone’s combined salary was $975 a month.) The New York field office was even more skeptical, arguing that Blin “must have been a person whose true pro-Soviet sympathies were not known to the public and his associates.” New York concluded that “I.F. Stone would not appear to be identical with [Blin]” and suggested that “Ernest K. Lindley was perhaps a better suspect.” (Lindley was a Newsweek Washington bureau chief who died in 1979.) Two other factors tend to rule out Stone. First, as probably the most persistent and high-profile critic of J. Edgar Hoover in Washington, he had no hope of avoiding the FBI’s notice. Also, the message naming I.F. Stone “in clear” was transmitted on October 10–between the two messages referring to Blin. This is a blanket claim for which the authors supply precisely two instances: in May 1936 Blin reported that Karl Von Wiegand, Berlin correspondent for the Hearst agency, “had been ordered to maintain friendly relations with Hitler.” Also that William Randolph Hearst supposedly had a deal to supply the Nazis with copper. Von Wiegand, disagreeing with Hearst’s policy, reportedly “turned to Pancake’s boss for advice.” Then in an August 1936 memo it was suggested that Pancake let William Dodd Jr., son of the American ambassador to Germany, know “that he has the means to connect him with an anti-Fascist organization in Berlin.” That’s it–I.F. Stone’s entire espionage career! He passed along gossip about Hearst and was in contact with Dodd–in 1936 a man whose sister, Martha Dodd Stern, if Spies is to be believed, had for two years been the lover of a KGB agent in Berlin and was already on Moscow’s books herself. If Haynes and Klehr weren’t so serious, this would be funny. But since they are, perhaps I can be forgiven for pointing out that the KGB file that Vassiliev now says includes Agent Pancake’s confidential report on Hearst (File 35112, volume 5) is not the one (File 3463, volume 1) he credited with the claim in The Haunted Wood that “a New York Post reporter codenamed ‘Blin’ volunteered information” about William Randolph Hearst. Though he had exactly the same material in front of him, in The Haunted Wood Vassiliev never identified Blin. Of course, anybody can make a mistake. But the mistakes in Spies all tend to go in the same direction. When Spies quotes from VENONA 1506, the authors leave out the figure for Blin’s income; they also leave out the words “it seems,” transforming what is clearly the writer’s speculation into a firm report of Blin’s willingness to make extra income. Spies cites a 1944 KGB report on Victor Perlo, an economist at the War Production Board, saying that in 1942-43 Perlo “secretly helped ‘Pancake’ [Stone] compile material for various exposés by the latter.” Judging by how frequently his name appears in VENONA, Perlo seems to have been a very energetic source for the Soviets; at the time of his death in 1999 he was chief economist of the CPUSA, where his contributions to Marxist-Leninist thought apparently merited a full-length article in the Great Soviet Encyclopedia. That he also acted as a source for Stone, whose coverage of defense production in PM and The Nation was described as “absolutely essential in the public interest” by Harry Truman, at the time chair of the Senate Defense Committee, merely shows that Stone was a good reporter. Of course, Spies cites this as evidence that despite Stone’s vociferous, and very public, criticism of Moscow and the CPUSA after the Nazi-Soviet Pact, he “quickly reverted to a pro-Soviet position.” But Spies also says that in 1945 the KGB, trying to assess the damage caused by Elizabeth Bentley’s defection, asked Perlo for a list of people he knew “who had a present or past connection with a Soviet intelligence agency.” The language is loose enough to cover a range of interactions, from witting agent to unwitting source. Nathan Gregory Silvermaster, according to VENONA an energetic clandestine agent, is on the list, as is Alger Hiss. So is Al Blumberg, the very public head of the CPUSA in Baltimore, linked to Herbert Schimmel, who in the 1940s was on the staff of the Senate Subcommittee on War Mobilization; neither man was ever suspected of spying. But Perlo’s list does not include I.F. Stone. Nor, though Spies quotes from it only selectively, does Gorsky’s later, and far more comprehensive, inventory of American sources. I don’t find it at all hard to believe that in 1936 I.F. Stone would have happily traded information with a Tass correspondent, whether or not he suspected the man had other duties. That’s what journalists did, and still do, including many, like Nicholas Daniloff, arrested by the Soviets in 1986, or Washington Post editorial writer Stephen Rosenfeld, whose relationship with Communism even Haynes and Klehr would find beyond reproach. And though the CP’s attack on Calverton also probably lost them I.F. Stone, who soon became an enthusiastic New Dealer, Stone’s overarching political preoccupation throughout the 1930s was the danger of fascism. It was fear of domestic American fascism, very much including the Hearst empire, during the Roosevelt recession of 1937 that led Stone to do something he still felt guilty about half a century later: change his name from Isidore Feinstein. It also happens to be true that, like “Blin,” Stone went to Washington in May 1936, writing afterward to Thomas Corcoran, FDR’s political lieutenant, “it was great fun to meet you and Ben Cohen and the beautiful Peggy.” (The team of Corcoran and Cohen were the New Deal’s foremost legal draftsmen; Corcoran’s secretary Peggy Dowd, a famous capital beauty and a cousin of New York Times columnist Maureen Dowd, soon became Mrs. Corcoran.) But Stone’s State Department contacts were nonexistent. He probably did know Frank Palmer (though as Spies notes, Palmer broke with the CP in 1937). 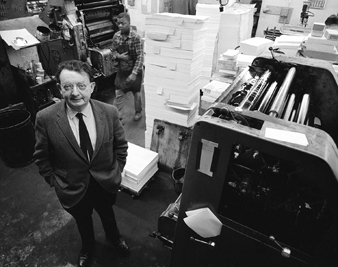 Stone’s brother Marc worked for Federated Press–and as A.B. Magil, a former editor of New Masses who knew both brothers told me, Marc Stone actually was a Communist. In 1937 Stone was a fellow traveler; he freely admitted as much. But when, in the fall of 1939, he wrote to his friend Michael Blankfort (a screenwriter who also became a friendly witness in the 1950s) that “I’m off the Moscow axis,” he meant it. The pact disgusted him–and the CPUSA’s slippery rationalizations disgusted him even more. When the Russians invaded Finland in November 1939, Stone compared the attack to the Nazi attacks on Spain. Stone’s disillusionment didn’t drive him out of the left. Nor did it blind him to the role of the Red Army in the fight against Nazism. Bitter as he was during the period when, in his phrase, “the umbrella flew over the Kremlin,” after Germany attacked the Soviet Union he rejoiced: Hitler “has ‘landed’ a huge anti-Nazi army on the Continent.” The Russians had joined his fight. Stone’s contempt for J. Edgar Hoover was more than enough to have kept him from running to the FBI in 1944. But “Blin” or blintz, he never again saw the Soviet Union through rose-colored glasses. Klehr and Haynes distort Stone’s views on the Korean War, accusing him of reporting that South Korea “invad[ed] the Communist North,” something he never did, just as they are wrong to claim that it was “not until the mid-1950s” that he “lost his illusions” about Stalinism. That had happened in 1939. His famous 1956 report from Moscow–“This is not a good society and it is not led by honest men”–was rather a warning to his fellow leftists that Khrushchev was no friend of freedom either. In a sane world, the supposed new material on Alger Hiss in Spies–and perhaps more important, the documents cited but used misleadingly by the authors–would raise many of the same questions. There is a KGB report from 1938 in which Iskhak Akhmerov, newly appointed New York station chief, writes, “I don’t know for sure who Hiss is connected with.” Far more troubling for those who consider the case against Hiss closed is the Gorsky memo, which, as quoted (accurately) in Spies, lists Alger Hiss under the code name “Leonard.” From John Lowenthal’s article to the present, much of the current controversy regarding Hiss concerns his identification with “Ales”–an agent who figures in numerous VENONA cables but who, when the material was originally released, was identified merely as “probably Alger Hiss.” It was this uncertainty that Allen Weinstein claimed to have removed in The Haunted Wood. And it was this uncertainty that was the subject of a 2007 article by Kai Bird and Svetlana Chervonnaya in The American Scholar (an expanded version is available on the magazine’s website). Gorsky, who in addition to his role as KGB rezident was also First Secretary of the Soviet Embassy, certainly knew who “Ales” was. He is, for example, the author of VENONA 1822, dated March 1945, which refers to the presence of Ales at Yalta, as well as another cable from March, not in VENONA but found in the documents Vassiliev submitted to court, that places Ales in Mexico City (at a time when Hiss was already back in Washington). The problem is not the whereabouts of Ales, however, but the fact that Gorsky, in his comprehensive résumé of damage to the American networks, didn’t connect Hiss with Ales. Why does this matter? Precisely because 1938 is not 1945. As Susan Jacoby points out in Alger Hiss and the Battle for History, among Americans who had an opinion on the matter in 1938, 75 percent supported the Spanish Republicans (backed by Moscow). In 1938 the Soviet Union was a potential ally against fascism, not an enemy. Until the Foreign Agents Registration Act became law in 1938, the KGB’s activities in America weren’t even illegal. Nor was belonging to the American Communist Party–even secretly–or meeting like-minded comrades after work, or even passing along information you thought might help the party to take an informed view of what the New Deal was really trying to achieve. Whittaker Chambers had no knowledge of Hiss after his own break with Communism in 1938. Yet as Jacoby notes, it is only the charge that “Hiss was a lying Communist Party member taking orders from the Kremlin as well as a State Department aide at the Yalta conference” that turned him into a poster boy for treason, symbolizing not just the resentment over “betrayal” at Yalta that Richard Nixon would ride into the White House but also, as Jacoby puts it, the “long-held right-wing contention that if you scratched a New Deal liberal, you might just as easily find a socialist or a communist.” Jacoby is often acute and surprisingly witty on the national psychosis that the Hiss case represents. But her nervous profession of her belief in Hiss’s guilt–like her willingness to write an entire book on the case without ever examining the evidence–strongly suggests that we are still far from living in a sane world. At least not as far as Alger Hiss is concerned. I’ll never be a Hiss scholar. I don’t have the patience to sift through the minutiae of typewriter serial numbers and Persian rugs and who got the Hiss family’s old Ford. Though my mind is less tightly closed now, the thought of joining the ranks of Hiss obsessives still leaves me cold. Nevertheless, I have a question for those who take comfort in the certainty that Hiss, though guilty, was an exceptional case–or the victim of a vast right-wing conspiracy: what if McCarthy was right? Not about Communists in the State Department or Owen Lattimore (a case that, though almost as celebrated as Hiss’s, merits only a passing mention in the footnotes of Spies; but then Lattimore really was innocent). But what if the New Deal was riddled with idealistic young radicals, some of them Communists, some Socialists, some Trotskyists, even some anarchists? How much of the great transformation of American society under FDR–agencies like the WPA that lifted millions from poverty to purpose and programs like Social Security and the TVA–derived its energy from not a cadre but a cohort of unabashed radicals who realized that the machinery of the state was available for what seemed like revolutionary ends, and proceeded to use it? And who saw the Popular Front not as a cynical stratagem but as a genuine turn toward a social democratic politics where on the central questions–industrial democracy and racial tolerance in America, antifascism in Europe–they had far more in common than anyone suspected? Of course, all this ended with the Nazi-Soviet Pact. And while the New Deal lasted, it was a heyday for those willing to exploit it–though my research on the New Deal suggests that even the KGB’s unwitting accomplices didn’t amount to more than a tiny fraction of Washington’s reds. But must we keep pretending it never happened?